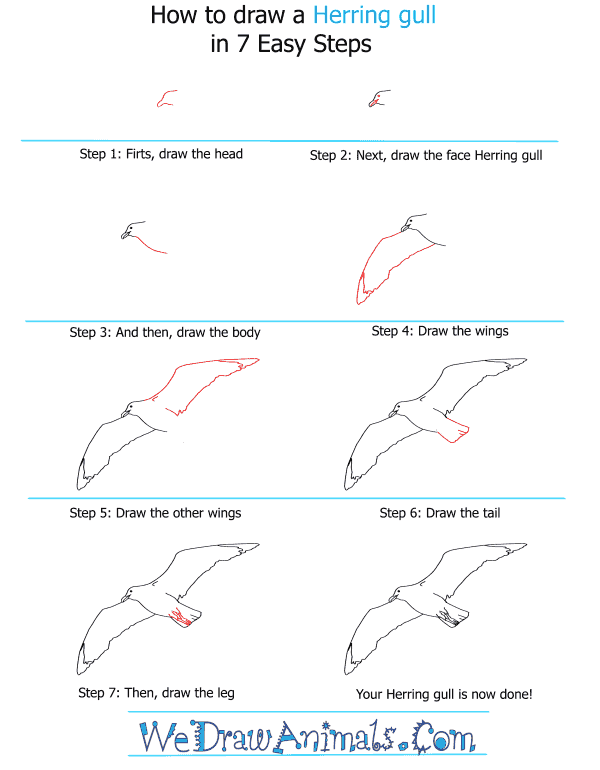 In this quick tutorial you'll learn how to draw a Herring Gull in 7 easy steps - great for kids and novice artists. 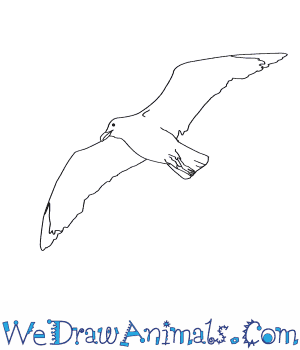 At the bottom you can read some interesting facts about the Herring Gull. Step 1: Draw two curves that bump outwards slightly in the middle and meet in a point for the head. 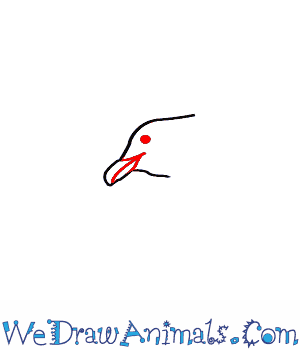 Step 2: Draw a line through the middle of the point for the beak, and a dot in the top bump for an eye. Step 3: Draw a downward curve from the bottom of the head for the underside of the body. 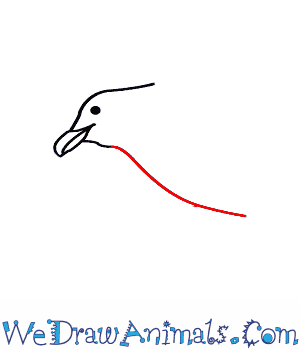 Step 4: Under the head and body, draw a bent V-shape with another, small and zig-zagging V-shape in the point for a wing. 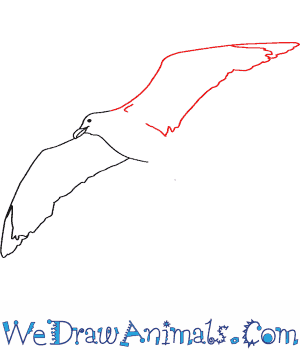 Step 5: Draw a mirror image of this wing on the opposite side of the body. Add a couple of lines near the ends to define where it meets the body. Step 6: Close off the gap in the rear with a square for the tail; add a couple lines in the bottom for feathers. 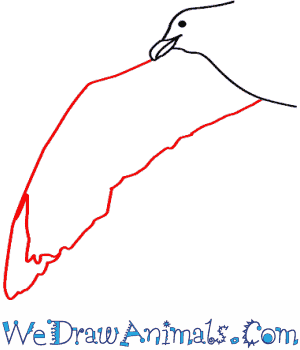 Step 7: In the rear of the body, draw a narrow W-shape with an oval at the bottom for a pair of legs. 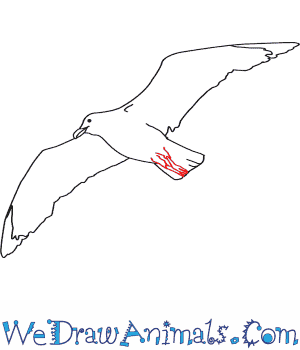 You have drawn a herring gull! You can color it white with grey, black-tipped wings. These birds use a complex system of calls and body language for communication. One easy to identify example is a high-pitched, dog-like bark that is used to both warn chicks from danger and to call for assistance from any adult gulls in the area in protecting the chick. If you hear this sound, move away, gulls are very protective of all the babies in their flock! The herring gull is the most common and familiar gulls found across coastal North America in the winter. They do fly in from the coast sometimes as well. They might be flying over a fishing boat or near a dock or in a parking lot.The gulls are scavengers and will make habitats near open water and other places such as plowed fields, landfills, picnic grounds, mud flats, intertidal pools and shallows along with fish-processing plants. They eat fish, insects, smaller seabirds, invertebrates, other gulls young and eggs, sea urchins, and crabs. They will also eat food near restaurants in parking lots. Herring Gulls are 22 to 26 inches long and have a 53.9 to 57.5 inch wingspan. They prefer drinking freshwater but will drink sea water if they must. Most people call these birds seagulls. Laying 1-3 eggs once per year, the eggs will hatch in 31 to 32 days from being laid. Sibling rivalry shows in the bird world. The third chick in the nest will hatch one or two days later than the other two. The third chick will get less food, weigh less, and grows slower because of this.